When you meet K.N. Vinod, co-owner and Executive Chef of Indique, it’s hard to imagine him as a fierce competitor. 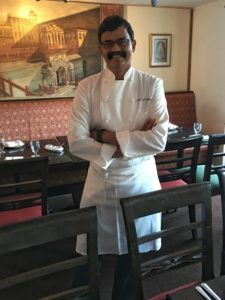 He’s a mild mannered man, who smiles easily and radiates with well-deserved pride about his restaurants, which also include Bombay Bistro in Rockville. Chef Vinod appears on the Food Network’s Beat Bobby Flay in an episode titled “Live from the Food Carpet.” The episode, which originally aired in January 2016, features Vinod confidently challenging the celebrity chef to a fish curry duel. Mid-way through the episode, Vinod is asked “if he can talk smack.” He responds with an endearing grin. While Chef Vinod ultimately loses the fish curry smackdown to Flay, he’s praised for a dish that is “executed masterfully.” I second that. Chef Vinod’s Kerala fish curry is steeped in a rich medley of ginger, garlic, shallots, coconut, malabar tamarind, and curry leaves. 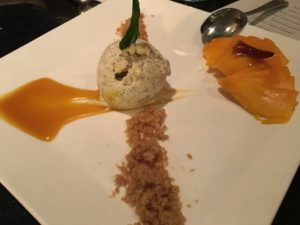 Regardless of the judgments made on “Beat Bobby Flay” it’s a winning dish, and just one reason to visit Indique, which has been serving Indian cuisine in Cleveland Park since 2002. Indique doesn’t need a television appearance to give it luster. 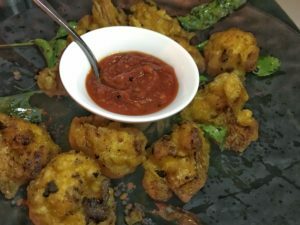 The restaurant, co-owned by Surfy Rahman, was recently revamped with a bright new decor, and now includes a heavy line-up of luminous street snacks. It’s a wonderful section of the menu on which to linger. 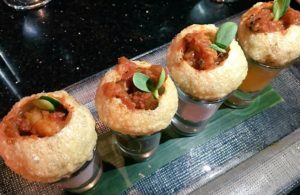 A highlight includes shrimp puchka shots, cleverly presented semolina orbs filled with spiced shrimp, tomatoes, and onions. They are perched atop a trio of juicy chasers of kokum, mango, and tamarind-cumin. Another street snack packing a powerful punch features cauliflower, lightly fried and tossed with vibrant green chili and curry leaves. Sweet potato chaat delights with scoops of mashed sweet potatoes flavored with amchur mango powder. 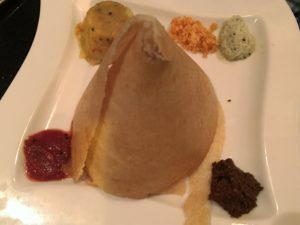 A vegetable mini dosa towers majestically over spicy potatoes and a variety of colorful chutneys. We appreciate the finesse in masala grilled cod from the “mains” section of the menu. The heat is turned up with chili-lime paste- the flavor is intense but not overwhelming. Saag Makai, from the classic section of the menu, combines spinach, corn, and fenugreek leaves into a luxurious and fragrant dish. Each dish at Indique takes its turn with a blend of Indian spices like turmeric, cardamom, chili, fenugreek, and mustard seed. Some dishes are appreciated as familiar and classic, while others take on interesting twists. Carlie Steiner, of Stir Bartending Co., has shaken up the cocktail menu at Indique. The Mumbai Mule with rum, spicy ginger, lime, and fresh curry leaf is a strong start. Mustard mango chili caramel sundae isn’t an expected to response to “what’s for dessert?” Keep an open mind, as mustard and chili are mild, yet interesting accents to the sundae. To compete in DC’s crowded restaurant field, it’s important not only to renovate, but to innovate. Indique just announced the launch of Chai + wifi, a daytime membership-based work space on the first floor of the two-story restaurant. This may be the brainchild of the owners’ son’s Rahul Vinod and Sahil Rahman, who recently joined the Indique team and plan to open their own fast casual spot next year. Also in the works for Indique is a new location at the Wharf, which is poised to become DC’s next hot area for restaurants. It will focus on the cuisine of South India, specifically the Kerala region where Chef Vinod hails from. 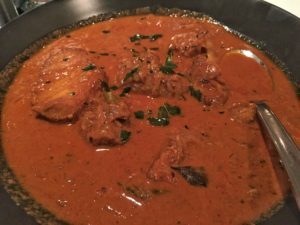 Indique impresses with notable Indian cuisine, and service that is warm, competent, and efficient. 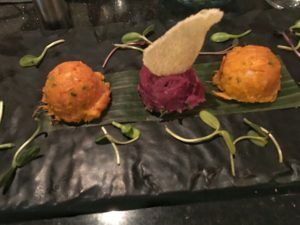 While Chef Vinod doesn’t manage to beat Bobby Flay, in Indique he has a restaurant that’s winning in multiple ways.